As I mentioned previously, Saturday was my birthday, and Max made me a special birthday dinner. To start the meal we had a simple mixed greens salad with olive oil and lemon dressing. The main course was one of my favorites - saltimbocca with risotto alla Milanese. Saltimbocca is made from veal scallops, sage leaves, and prosciutto di Parma, and risottoa alla Milanese is made with veal stock, red wine, saffron and quite a bit of butter. You may wonder why I've included this is the "Swiss" category. Well, Switzerland is made up of 4 distinct cultures (and languages); the most populous German, the French, the Italian and the Romansch. While saltimbocca and rissoto are quintessential northern Italian dishes, they are considered to be just as much a part of the food culture of the Ticino, the Italian speaking region of Switzerland. With dinner, we also had a wonderful wine, a Crôutin Riserva Personale Mario Scrimaglio 1997. I'm not the wine expert in our family, Max is so I'll have to poke him to add some details about the wine in the comments or something. It was a wondefully full-bodied wine, with a lot of plummy and raisiny aromas and just enough tannin, and it went wonderfully with the meai. 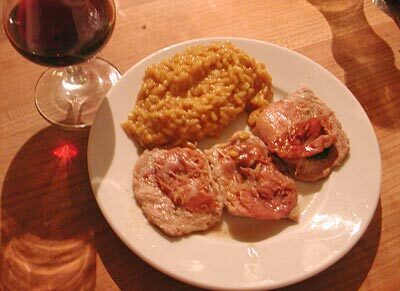 So, here are the recipes for both the saltimbocca and the risotto. They are both very easy to prepare, and utterly delicious. If you're a beginning cook, this would be an ideal meal to make for guests, since there isn't much you can screw up as long as you watch the stove. Prepare the saltimbocca; start the risotto, and as the risotto is finishing quickly cook the saltimbocca. Due to the rather large amount of butter in the risotto, it's not exactly diet food. Soak the saffron threads in a little lukewarm water. Finely chop the small onion. Sauté in about 1 Tbs of butter until just translucent. Add the rice. Add more butter and sauté until the rice is just a bit browned. Heat up the stock in the meantime. Take off the heat and add the cheese and the rest of the butter (please, don't use pre-grated Parmesan from a canister...get a chunk of real Parmesano Reggiano, or at the very least a good Grana Padano or so) Stir until melted. Taste and adjust seasoning with salt and pepper. Saltimbocca is another classic northern Italian dish, and it's very popular in Switzerland. We can even get pre-prepared saltimbocca (with the proscuitto and the sage) at the supermarket butcher counter. The word saltimbocca means "jump in your mouth". You don't see saltimbocca as much as other veal dishes outside of Switzerland or Italy for some reason - it's really delicioius. The key here is to have real proscuitto di Parma, and fresh sage leaves. This amount serves 4 people; halve for a dinner for two. Assemble your saltimbocca: put a sage leaf on top of each scallop, add a slice of proscuitto, and attach them together with a toothpick. Lightly salt and pepper. Heat some olive oil or in a pan until hot. Put the saltimbocca in, ham side down. Cook at high heat for just 2 minutes, then turn. Cook for another 2 minutes. Serve immediately with the risotto. Submitted by maki on 2004-01-26 07:37. What a lovely birthday dinner! After having received some poking, here a few comments about the wine. Well, the oenologists have quite a distinctive vocabulary, which is hard to copy, and not being an oenologist, I am not so familiar in using it ... understanding is something else. Anyway, the Crôutin is actually described on line, on the website of the producer, Vini Scrimaglio in Nizza Monferrato in the Piemonte. Oh, if you have problems with the Italian language, change "italiano" to "english" in the link above. The local wine dealer, Ad-Libitum has an explanation for this wine's name. It is an old word from the Piemonte dialect, and it means that corner in the cellar where the owner has his own, personal reserve. Knowing wine makers, that means that this is the best wine in the cellar. The wine was indeed one of the best wines we had with a meal ... absolutely worthy for the event. You don't drink much of it, as it is relatively high in alcohol, but that is never the intention anyway when you drink wine. Hi from Ticino again! My husband's mum has a little trick for getting creamy risotto without buttering it up with too much fat. We use olive oil at first, just enough to coat the pan bottom, and like in your recipe, add a sip of olive oil after putting in the rice. After making sure the rice is well-coated in oil, we add about a quarter cup milk and let it evaporate a bit before stir before adding the wine. Admittedly your risotto might not sing Aida after that, but the creamy, lower-fat rice is your new cantata! I suggest to try the Cotoletta alla Milanese, in Japanese cuisine there is something very similar.